Speedo Canada Makes Swim Gear for the Whole Family! After more than two decades, I finally parted with my oldest swimsuit. It was old, and threadbare, and...old! Yes, I'd had other swimsuits over the years, but this was the bathing suit that fit me the best, or rather, still fit me at all. However, I had to draw the line when my swimsuit turned "transparent" like the Emperor's New Clothes! So I contacted Speedo Canada to see if they had any recommendations for me. I wanted a swimsuit that would be great for both the pool and the lake--but also one that would be great for lounging at the beach! Over the years I had owned some great Speedo tankinis, but unfortunately I had grown out of them, rather than "outgrown" them (if you catch my drift). On my wishlist for a swimsuit: a good, supportive fit; one that looks great on; a fabric that is light but durable; and a swimsuit that will not change colour in a chlorinated swimming pool (my last swimsuit went from a royal blue, to a pale blue). Thankfully, Speedo Canada delivered on all of these points. The Speedo Canada Endurance brand swimsuit boasts that it lasts 20 times longer. It features a 100% chlorine resistant fabric, and high-impact built-in support for women. As soon as I put on the swimsuit, there was no doubt that it fit my specific body type. And as the bathing suit had some "give" by virtual of some stretch, I believe that it would support many different body types and figures. That's great, because we're not all made the same way! 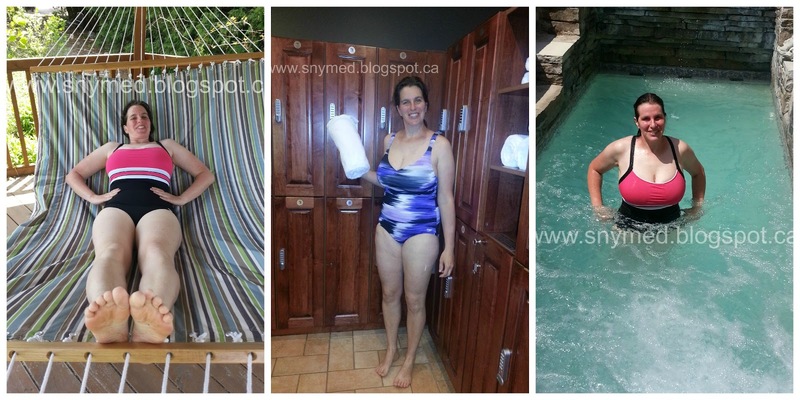 My New Speedo Canada Swimsuits: At Rest & In the Pool! I made a little video of my Speedo Canada bathing suit in the lap pool while I was at Ste. Anne's Spa in Grafton, Ontario (below)! I love to swim for leisure, but swimming for health and fitness is also one of my primary goals. You won't notice a bathing cap in my video, as I never wear them. But I did forget my Speedo swimming goggles, which you can see in the top photo of this blog post! I love that they have a special pair designed for women, which are smaller and fit better. The Speedo Canada swimsuit performed quite well and I was very pleased with it. Whether swimming 20 laps or 200, I was confident that it would stay put so I could concentrate on swimming. I would definitely recommend the Speedo Canada Endurance swimsuit line! (VIDEO) Putting My Speedo Canada Swimsuit to the Test! 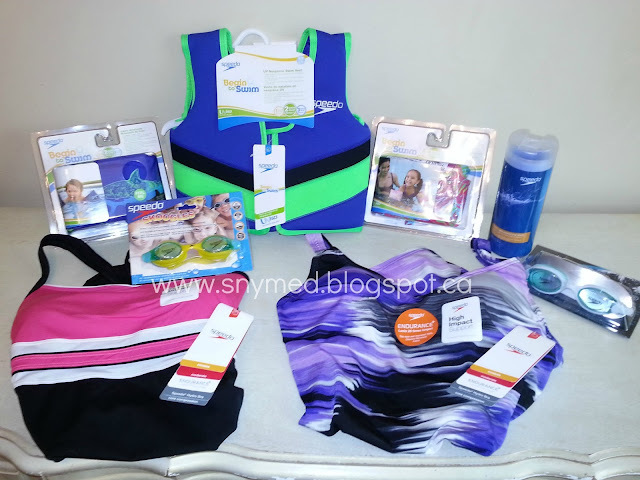 As the mom of 5 young kids aged 2- to 7-years old, I was also quite pleased with the Speedo Canada kid's swim line, which offers lifejackets, swimming goggles, and water wings. Although the Canadian summer is short, my family uses an indoor swimming pool all year round. I like the design of the Speedo Canada child life vest very much, as it has a very slim profile, and is not cumbersome in the swimming pool. We do have other lifejackets that are just too bulky for the swimming pool. 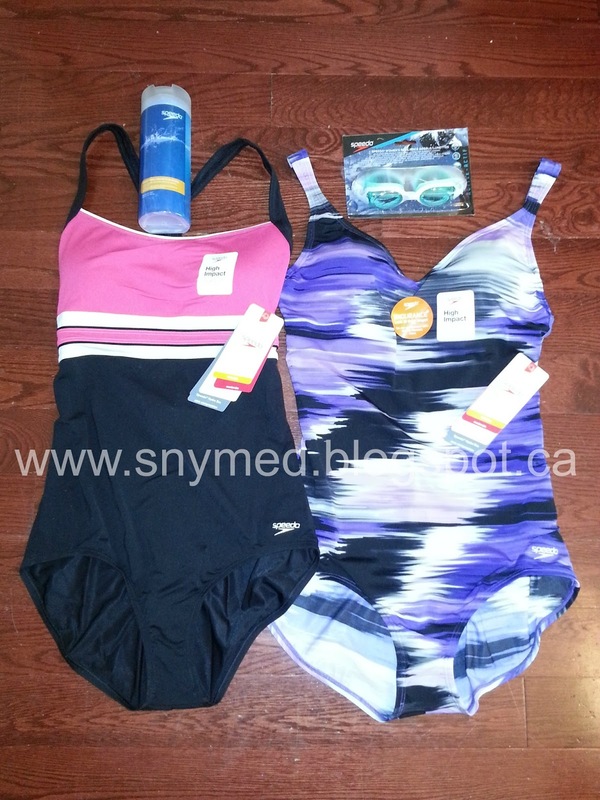 I also like that Speedo Canada offers children's swimming goggles, which allow for a proper fit. It's great that once my kids put them on, they stay put and don't let water in. Adult goggles are too big for kids, and of course don't create a proper seal with their face. The Speedo Canada water wings are also great for kids learning how to swim, but remember these are not an substitute to a lifejacket. Do you and your family enjoy swimming? When was the last time you bought yourself a new swimsuit? I buy a swimsuit at least twice a year. Crazy right? But one for our winter trip away and one for the summer. I love to swim, although admittedly don't do it often. My oldest is just getting over his fear of water. Those suits are very flattering, and I had no idea that Speedo had other things in their line - I thought it was just swimsuits! mamawee, my middle child recently got over his fear of the water. It seemed to happen "overnight". It helped a lot that our pool has a super shallow kid's section. Me too, Debbie! I remember having my swimming badge sewed to my favourite Speedo swimsuit. I was so sad when I grew out of it! I never considered a Speedo but they look great! I *try* to swim every week but I have been slacking lately... Great post Jenna! Thanks Shannon! It's helpful that my local pool has extended hours, which makes a big difference, I find. I am in need of a new bathing suit. I will definitely be checking out their collection. Thanks. Kristen, I was surprised by how many different swimsuits Speedo makes. The choice of their competitive ones are endless. I'm in desperate need of a new swimsuit (post Triplets). I've always had a Speedo and have gone back to them time and time again. Good on you for posting a picture of yourself in one. You look great. Now that I have kids, I'll have to look into their kids line, especially their "begin to swim" product as that's the stage we're at. Thanks a lot, Sarah! 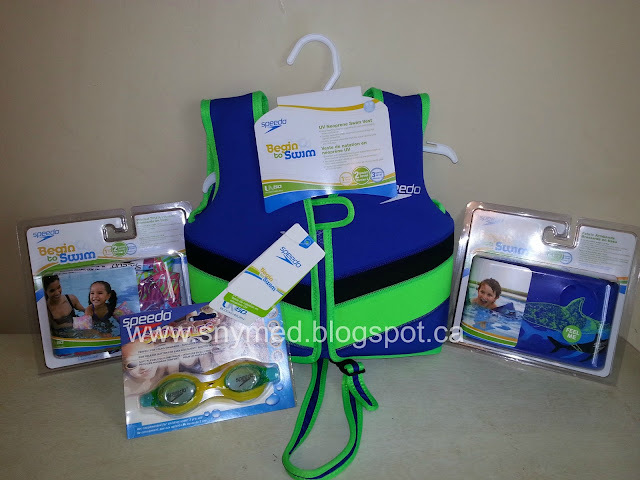 My kids loved the Speedo kids products,and were fighting over the water wings and goggles! I'm actually due for buying a swimsuit! You look great by the way! Speedo makes cute stuff! Never tried their bathing suits, but I think next year it will be about time I get a new one. or at least a new top, sick of showing what I think is a wee bit too much cleavage. I think Speedo makes amazing and lasting swimsuits! I know I buy speedo swim trunks for the kids because they love the water and it can really withstand the chlorine water!